Ransom has always been my favorite son of 9FB3 Fullback. 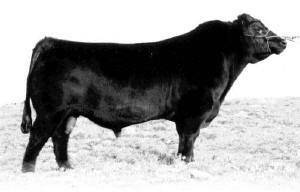 I first saw him as a calf on display at Denver where he exhibited tremendous muscle shape and base width for an Angus bull. He combined that with an exceptionally clean front and was really good footed, which is not always the case with 9FB3 progeny. Pay attention clubbie guys...the grand-dam of Heat Wave had a smokin' Ransom heifer this past year.